Reach & Read: Six Books of Fable and Folktale for Children of All Ages – Odds & Hens : Ramblings. Creations. I enjoy a good fable, parable, tale or story to help illustrate a lesson, prompt new thinking or reframe a problem. One that comes to mind really quick is the empty boat Tao story….. But in this post I want to share reviews and thoughts on six books gifted to me by August House in exchange for my honest review. What a treat, really as I would not have likely come across these particular presentations of classic storytelling. I found them all enjoyable and encouraging of follow on activities (like baking some cookies!) 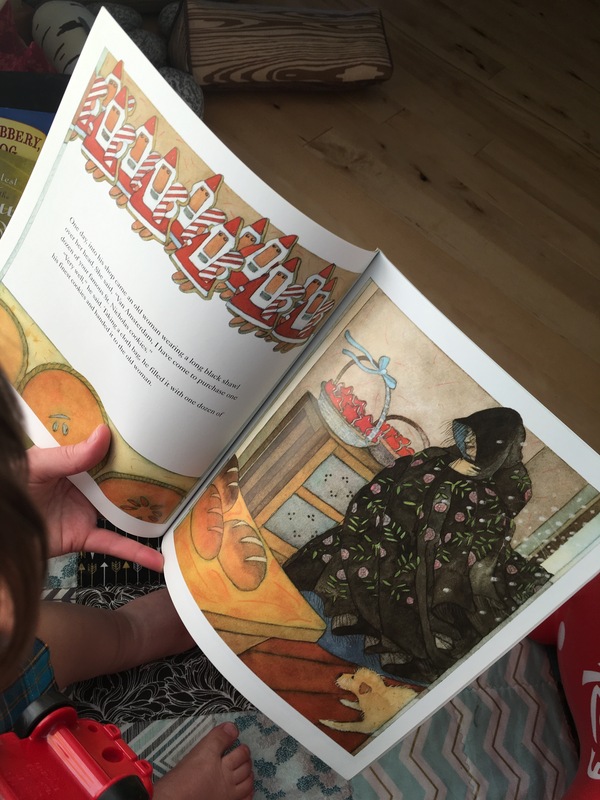 Read on to learn about the Little Red Hen, origin of a baker’s dozen, some mischievous fairies, a slobbery dog, the smart kind sun and lastly a compendium of even more diverse tales. I love my chooks books! This timeless tale is told with succint lines, phrasing that perked up the ears of my toddler and prompted some ‘reading’ along (He loved the line My! My!). The book is written at just the right pace to keep the story moving but make clear the point of how important it is to pitch in and help with others. The illustrations are pleasing and catchy to the eye (both child and toddler). They are not too over done, predictable or crowded but still have some humorous, whimsical elements (the mouse in particular is comic relief) and offer the reader-in-charge items to question the listener about. Show me the dog, the cat, can you spy the mouse, what color is the string etc. I appreciate being able to spend more time in a story, toddler permitting and this book certainly supports that reading connection, it also offers an excellent alternative to the mass-media version. I certainly recommend this retelling of the classic fable and am thankful it has joined our bookshelf at home. Anyone have a family favorite recipe for St. Nicholas cookies to share? Another fable from the Forest and Gaber duo complements of August House! I was not familiar with this particular Aesop fable in which Forest prompts the reader to think about whether or not gentleness, instead of force, can be a means to achieve a goal? Big question for a little people’s book but rings quite true in current day. The wind is bit of a braggart and eggs the sun into a contest to see who can get an unsuspecting man’s jacket off first. The wind tries to force it (think huff and puff) and sun kindly address the reason for the coat being on to begin with but imparting his (or is it a her?) warm rays. Guess who wins? The illustrations are quite elaborate and (naturally) I love that there are honeybees on almost every page and she uses the phrase ‘sweet as honeycomb’ to describe the kind canine. However, this particular fable was not a favorite at our house despite being familiar with other versions like Beauty and the Beast. I think it is really the part that the father gave his daughter (albeit beloved) away as a prize that influenced us the most. I try to be aware of potential themes that might raise questions or fears as it relates to adoption or foster care. For this single reason, we probably won’t be reading this again until little man is much older and we have a better idea of how he perceives the topic. I would still encourage others to read this book and enjoy the colorful and active illustrations. It is not every day that the word flummoxed shows up in a children’s book. Flummoxed however captures the historical setting perfecting and for those not familiar defined on the last page [ confuse, perplex, surprise or befuddle] – all of which the smart woman did! You also learn the word ‘seanachies’, which was new for me, meaning Scottish storytellers. I would imagine that i have a few of these in my family tree. The illustrations are actually a bit hysterical, given the manly man type of fairy king with teeny legs and the perfect rainbow septor. Love! The story is quite clever and highlights what lengths a parent will go to keep family together, but also be kind to others. She also teaches the fairies a few lessons in greed and practical things like what you need to bake a cake. The lesson learned through all of this is that ‘fairies gold (my note: think of this as gratitude) is like love or knowledge ~ or a good story. It’s most valuable when it’s shared.” Please share this story with your family, you won’t regret it. This is the last one by Heather Forest in our stack of books so kindly gifted to us by August House. While it was just published this year, it is brimming with retellings from around the globe and across many diverse cultures. I love this fact! As there is more and more attention on how books should or do or don’t reflect diversity, there is literally a treasure of them already in existence. They just need retelling. I hope Heather puts more of these into children’s books, making them even more accessible at a younger age. Tales in this book range from Greek, Norse, light versions of Homer, Roman times, Sumerian, England (think Beowulf), Persia, India, China (Mulan), Japan, and all across the Southern Hemisphere. This particular book is more advanced that we are ready for at our house but in a few years will be fun to read the tale, talk about what we know already (maybe related to main stream story versions) and pair with learning more about the particular culture featured. Could also be class room resource. The book has a bibliography section with author notes from her research, remember that many of these stories were in oral form only for centuries. Thank you to the author for all the research. What are some of your favorite fables and stories to tell?